It was first reported July 11th, that an Air Tractor 502B with West Wind Air Spray Ltd. of Lethbridge was here spraying fields. 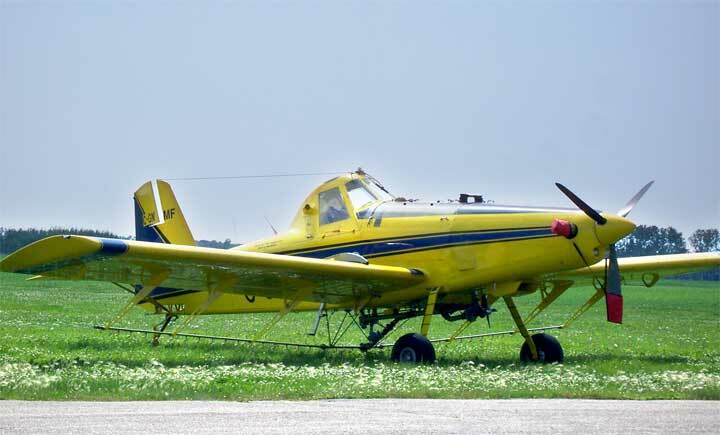 The demand for service increased as the wheat midge infestation appears to have worsened and West Wind brought in a second aircraft, an Air Tractor a piston powered 402. Now there is a third aircraft involved a 2003 Air Tractor 502B (seen above) operated by Dale Air Services of Morris Manitoba. The application of insecticide from the air is very effective in dealing with the wheat midge but requires some very narrow parametres for the work to be done. The spray must be applied when the temperature is below 25ºC which means at this time of the year the three air craft are firing up and going to work just after 4:00 am. Most evening they are not able to get back to work until after 7:00 pm. These turbine powered Air Tractors deliver the insecticide at about 140 mph with 500 US gallons in their tanks at take off.